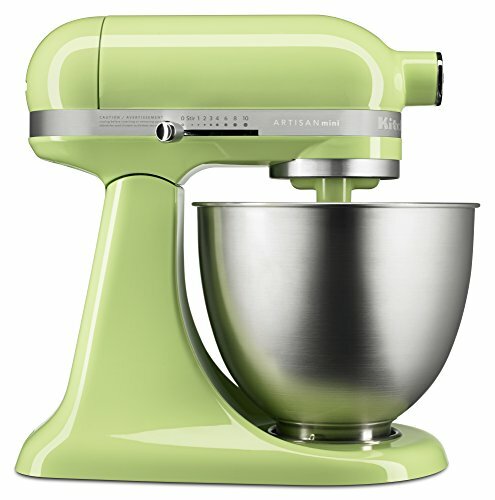 KitchenAid Artisan Mini Stand Mixer in HoneyDew Green! A new mixer and a new color for 2016, this KSM3311XHW Mini Mixer is a great addition to the KitchenAid stand mixer line. You’ll have one of the best stand mixers for the small kitchen when you buy a KitchenAid mini stand mixer in the color honeydew. And if you like the color green, this little mixer is a lovely lighter green shade that will look great on your kitchen counter. For fans of green n the kitchen, this honeydew shade of Artisan Mini Mixer would look good in several kitchen decors, or color themes. Obviously, if you have a lot of green in your kitchen, then this flavor of green would fit right in. But it also would look good in a kitchen that is painted orange or pink. Hey, people paint their kitchens all kinds of colors, so why not pink? I don’t think there’s any color police for kitchens, so do your own thing! In the end it really doesn’t matter what color your kitchen is, if you think the green honey dew mini artisan would look good, go for it! It’s YOUR kitchen after all, so why not use colors that make you happy? See, the bottom line is this… although honeydew green is a nice color, it doesn’t matter what color stand mixer you choose, a KitchenAid Artisan Mini is going to do a great job.This mixer has the same power as a Classic Kitchenaid mixer, but smaller size and weight – that means it is easier to fit into your kitchen, and to move around whenever you want to. So how could you go wrong? There are a couple of different deals available for this green mini mixer. Deal #1: Mixer, bowl and 3 types of beaters. You can see this in two places in this post, both in the “Pros and Cons” box above, and it is the mini mixer on the left side in the pictures below. This stand mixer bundle come with the mixer of course (big surprise, right? ), and also comes with 3 attachments: the flat beater, dough hook and wire whip. These 3 beaters fit ONLY the Artisan mini mixers. It’s important to get beaters that are the right size for your mixer since the distance between the head of the mixer and the bottom of the bowl varies in the different models. The right size beater will ensure that it’s reaching the sides and bottom of the bowl correctly and thoroughly mixing ingredients. And at the same time, not banging up the bowl! This deal also comes with the 3.5-Qt. Brushed Stainless Steel Bowl. Note that neither one of these packages has a bowl with a handle. At the time I’m writing this, only a few of the shades are available with the handled bowl, and unfortunately, this isn’t one of them. So if having a handle on the mixing bowl is a big deal for you, best look at another color Artisan mini. Deal #2. Mixer, bowl and Flex-Edge beater. You can see this deal at the very top of this post and in the picture above it’s the mixer shown on the right. In this bundle you not only get the Honeydew Mini Mixer, but it also includes the Flex Edge beater, which is a specialty beater. The flexible edging on the beater does a great job of swiping mixture away from the bowl and getting it all mixed together. If you buy this beater separately, it usually costs somewhere around $40. As with the other package, it has the smooth sided 3½-qt. stainless steel bowl. 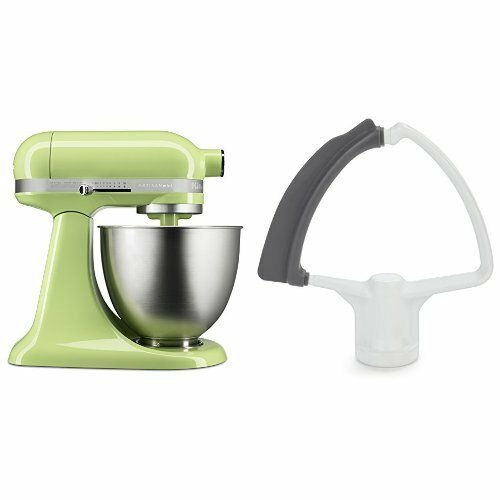 So it all depends on what you want most with your green Honeydew mini mixer: the flex-edge beater, or a set of 3 attachments that includes flat beater, dough hook and wire whip. Keep in mind you can always buy one package, then buy the other kinds of beaters at a later time if you wish. So if a green Artisan mini mixer with the yummy color of Honeydew melon that looks good and does a good job is the right combo for you, get yours today! You’ll see a whole bunch of them in one place on Amazon! You can see more info about the little stand mixers in the video. Not my favorite shade of green, but guess they have other colors I like better.